The Equivalent Initial Quality Method is presented for fastener holes since this is the most prevalent source of cracking in aircraft structures [Rudd & Gray, 1978]. Quality may be defined as a measure of the condition of the structure relative to imperfections, flaws, defects, or discrepancies that are either inherent in the material or introduced during manufacturing of the structure. The approach is to quantify these imperfections by representing them with fatigue cracks of a particular size and shape, such as the corner cracks illustrated in Figure 3.2.1. Also illustrated in Figure 3.2.1 are some of the parameters that can contribute to the initial quality of fastener holes. If an initial quality representation is performed for each of a number of fastener holes, an equivalent initial quality statistical distribution can be used to quantify the quality of the fastener holes produced by certain manufacturing and processing procedures [Potter, 1978]. The initial quality representation, defined as the equivalent initial quality, can be obtained in the following manner. Consider a piece of structure with a fastener hole containing the defect of characteristic dimension l (Figure 3.2.2). This defect results in fatigue crack initiation and propagation when subjected to some known load history. Upon failure of the structure, a fractographic examination of the fracture surface is performed to obtain as much of the crack growth curve as possible. Analytical crack propagation analyses are performed until there is good agreement between the analytical prediction and the fractographic test data. The initial crack length (crack length when the load history is first applied), ai, of the analytical crack growth curve that correlates best with the fractographic test data is defined as the equivalent initial quality. Hence, ai is said to be the analytical equivalent of the actual defect of characteristic dimension, l, if each results in a crack size ae after Ne cycles of the same load history have been applied. 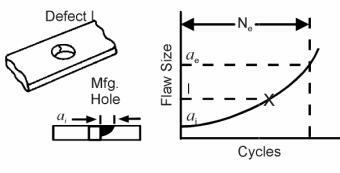 Hence, fastener holes that contain actual crack lengths less than ae after Ne cycles have been applied are of better quality than those that contain actual crack lengths equal to or greater than ae after Ne cycles.